I love this line of fabrics from Thimbleberries. It's called "Greetings from Canada" and I still find some now and then at local quilting shops and even Fabricland. I've made a few of these little quilted table toppers for hostess gifts when I've traveled and they fit easily in a suitcase if you're limited in your luggage space. There's probably enough scraps left for one more project and I think it will be a longer, skinnier table runner. And I finished them off with my new labels from spoonflower.com. I made a label on Word, choosing my font and adding the magpie picture. When I had the size I wanted, I printed it out and then used my scanner to scan it into the correct format for uploading to Spoonflower. 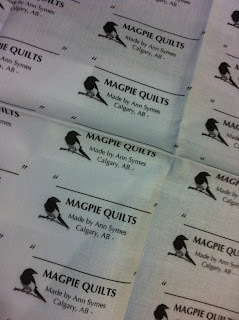 I have a space for the name of the quilt and room after Calgary, AB for the year. It adds a nice finished touch to my quilted items and saves me time too!